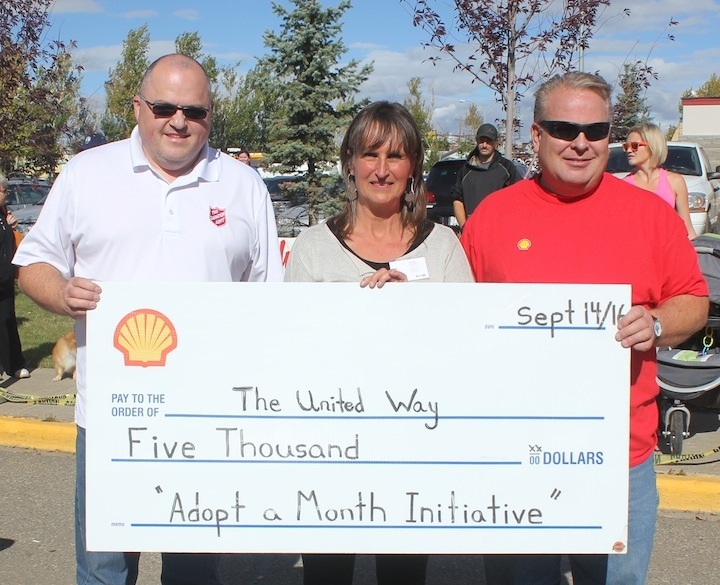 Shell Canada is the first supporter of the United Way's newest Adopt A Month initiative. The company supplied the agency with it's first $5,000 cheque to help purchase fresh produce and other perishable food items for the Salvation Army's food bank. "We're really proud and humble that we can do the first month and we hope other companies can follow us," said Wouter de Klein, operations manager for Shell Greater Groundbirch. De Klein said staff at the local office were particularly moved by seeing the 689 pairs of shoes recently placed at 100 and 100 in Fort St. John to bring awareness to the number of people that use food banks in the city in the average week. "It's tough. We know we are in a downturn, but seeing the shoes, it really shows, makes it visible, how many people need help. We are here to support the community. Hopefully next year there are less shoes there." The United Way is looking to raise $5,000 a month over the next year to support the initiative. "Imagine feeding your family when you're struggling on just the dry goods in your cupboard," said Niki Hedges, community development and campaign officer for the United Way. "No milk, no eggs, no bread, no fresh fruit, vegetables or meat. We want to top that up with perishable goods so families actually have that support and nutritional needs."